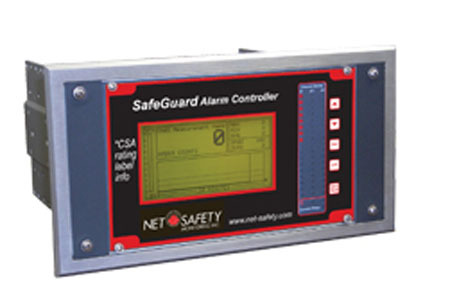 The Net Safety SafeGuard Alarm Controller is designed as a cost-effective mini-system controller alternative to expensive PLC systems. The SafeGuard comes standard with a centralized, easy-to-read LCD providing simultaneous status on 16 channel inputs as well as several expansion options including Mimic Display capabilities and HMI software packages. The SafeGuard can be equipped for any application, indoors or out, with your choice of a basic wallmount, a weather-proof fiberglass enclosure or rack panel mounting.